I never knew the range of possible relationships between dogs and cats until I read this. Dogs have a natural instinct to chase small prey that flee. If appropriately socialized, cats and dogs may have relationships that are not antagonistic, and dogs raised with cats may prefer the presence of cats to other dogs. Even cats and dogs that have gotten along together in the same household may revert to aggressive reactions due to external stimuli, illness or play that escalates. 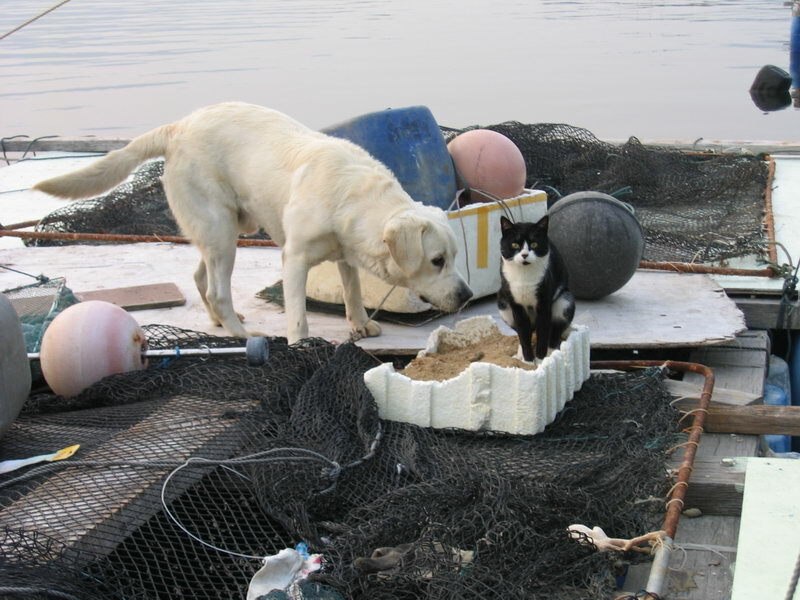 Here is a photo showing Dor Dor and the cat that also lives on the fishing raft. Afterall, they don’t seem to be antagonistic! Some readers asked whether Dor Dor has any friends that are not human. In fact, his life on the fishing raft can sometimes be quite lonely. Apart from the toys he has, his only friend is this cat. Incidentally, this cat looks quite like the black and white toy he used to have close by him when he is sleeping.